Today we had six whale shark encounters which turned out to be five individuals. One shark was new to us, a three metre male. 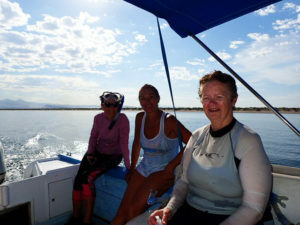 Two are known from La Paz bay and the remaining two were first sighted 1000 kilometres north of here in Bahia de Los Angeles two years ago. One of the encounters was extra special as the shark, a 5 metre or so male, was feeding in a vertical position, allowing us to swim around him for some time. La Paz bay is super-productive right now and more and more sharks are arriving to take advantage of these rich feeding grounds. For information on how you can support the conservation efforts of Whale Shark Diaries by joining us for responsible encounters with them in La Paz, Mexico, click here. This entry was posted in guests-supporters. Bookmark the permalink.